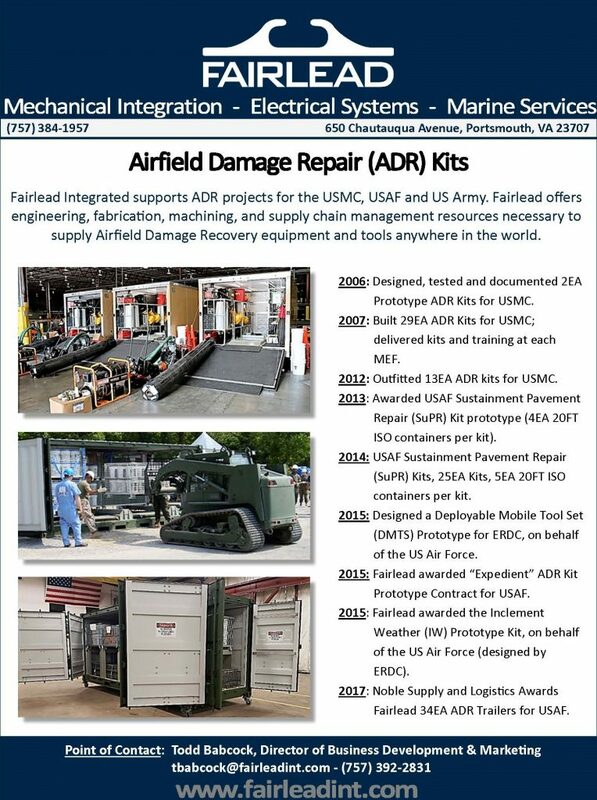 Portsmouth, VA – 24 January 2017 Fairlead Integrated is pleased to announce their award for 34 Airfield Damage Repair (ADR) Trailers by Noble Technologies, a company based out of Orefield, PA. The ADR Trailer stores the tools and equipment necessary to repair airfields due to combatable situations and aircraft mishaps on the runway. The trailers are self-contained and transportable by commercial and/or by military means via air, highway, ship and rail. When the war fighter has the ability to make rapid repairs to the runway, this increases the military’s competence and safety, especially in high war zone areas. Fairlead designed and built the prototype for the ADR Trailer in 2015, for the Army Engineer Research and Development Center (ERDC), on behalf of the USAF. The ADR Trailers will be assembled and tested in Portsmouth, VA and will meet the delivery schedule of completing one ADR Trailer a week for 34 weeks. For more information about this topic, please contact Todd Babcock at (757) 392-2831 or tbabcock@fairleadint.com.